A grand occasion calls for a grand vintage champagne and some glorious glasses for the toast! 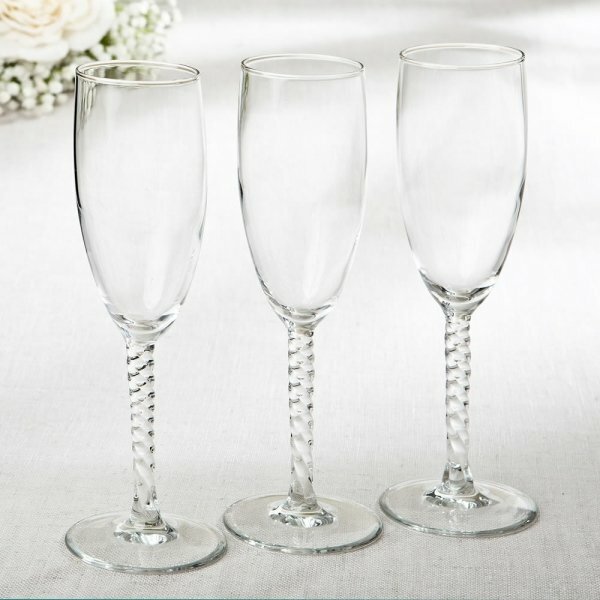 Your guests will be delighted to toast your occasion using beautiful champagne glasses with a twist! Each glass features a classic flute shape with a slender bowl top and an elegant long twisted stem. Place one at each table setting as a thank you gift for your guests. Fill them with colorful candies or simply use them to serve champagne for toasts to the bride and groom. NOTE: Must be ordered in multiples of 12 (12, 24, 36, 48, etc.) Failure to do so with delay the shipment of your order. A fabulous way to celebrate a grand occasion! Can I engrave each champagne flute with something different? 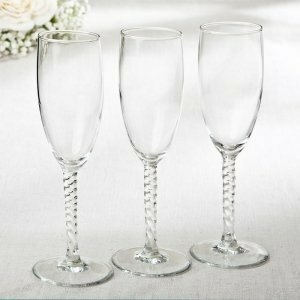 Unfortunately, the Perfectly Plain Twisted Stem Elegant Champagne Flute doesn’t have an engraving option.